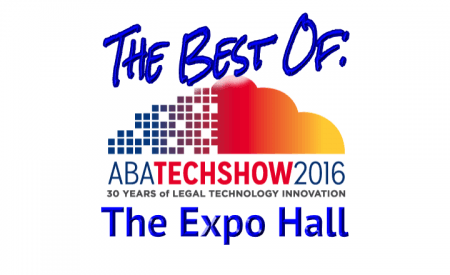 So, from announcements, to demonstrations, from not fighting to… not fighting, and, of course, puppies… here is my edition of the Best of ABA TECHSHOW 2016: The Expo Hall. In what was apparently amazing timing, Rocket Matter began the week of ABA TECHSHOW by announcing that it was launching its new User Interface. They completely rebuilt the UI to be easier on the eyes, and much more intuitive. Featuring a left-sided menu bar, lightbox windows for adding new information (without navigating away from the prior screen), and a whole host of upgrades that you can check out in my video review of the updates with none other than Rocket Matter CEO Larry Port, himself, which is scheduled to post on Monday, April 11. Make sure you also check out the new templates and workflows they’ve added! 2. Smokeball announces Smokeball AI. As a sucker for big data, I was immediately taken in by the concept pitched by Smokeball in their new feature Smokeball AI (“Activity Intelligence,” so settle down!). The new tool is primarily a reporting and data tool, keeping track of your activities automatically throughout the day. It only captures the information relevant to individual cases, and allows you to see overall productivity, that of individual members of your staff, or for particular cases or tasks. If you’re not ready to pay for a full-featured project management tool, this could be great for your firm. Probably the most successful of the cloud-based practice management systems at connecting with other services, Clio announced a couple more major integrations. First on the list is their upgraded integration with Ruby Receptionists, the remote (don’t call them virtual) assistant for your law firm. Law firms that use both Clio and Ruby will be able to automatically integrate a whole host of phone call and contact related information (like voicemails, return calls, etc.) directly in your case file. One of the coolest features I saw in the demo was receiving a notification about a voicemail, and having access to the audio file of the voicemail as well. Right in your Clio system. The second announced integration is with Vonage Business, the VoIP phone system for small business. While I did not get the chance to see a demo of this integration, it appears that the two integrations will offer similar functionality – making sure all phone calls and messages get to the right attorney, and are recorded in the appropriate case. … and, of course, you always have loiterers and hangers-on like this group. While MyCase didn’t bring the kind of flashy announcements that Rocket Matter and Clio had for TECHSHOW, theirs may be more immediately useful for solo and small law firms – MyCase Payments. Now, MyCase customers will be able to charge their fees to their clients credit cards directly through the MyCase practice management system. While this might not seem that critical for anyone who’s never worked in sales, this is huge. By connecting through MyCase, law firms will get paid quickly and securely, and will pay a flat 3% transaction fee. If you’re interested in a video talking about MyCase Payments, check this one out. If you’re not familiar with Lexicata, you should get familiar. They’re really the only true CRM (Client Relation Management) system for lawyers right now, and if you don’t use one now, you should look into it. Basically, Lexicata helps law firms track relationships – from pre-intake all the way through the end of your clients’ matters, to help you make more money. Now, Lexicata integrates with Ruby Receptionists to help you automate and track even more of the process. When a Ruby Receptionist takes a call for you, they will be able to add the prospective client’s name, contact information, and basic case information into a form that plugs right into Lexicata. With just a couple of clicks in Lexicata, you have yourself a new matter! … on March 23, it responded to the lawsuit with a full-throated defense. 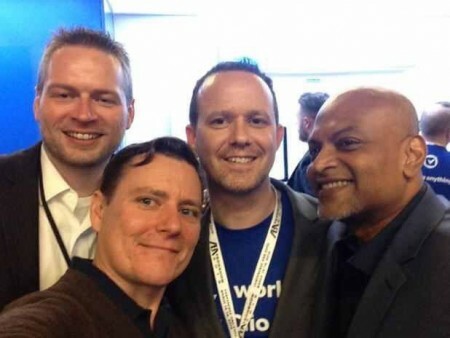 I suppose the only reason there was peace at TECHSHOW was because the peace treaty had not yet been violated. Also, why didn’t Casemaker talk about their plans for the RuleBook app at TECHSHOW…? So no new “…Pad” product announced this year. LIT Software, makers of the immensely popular TrialPad, TranscriptPad, and DocReviewPad don’t have anything new to share. But that didn’t stop Jeff Richardson (of iPhone JD fame) and myself from asking. Of the three ideas listed, I was really sad to hear that my favorite of the group – an app to help with video depositions – was the one least favored by LIT. In my opinion, the video deposition app provides the perfect connection between TrialPad and TranscriptPad. Until recently, Sharefile has been more about helping you manage documents than anything else. Well, they’ve decided that they’ve had enough of that! So they’re getting into the case and practice management business with Sharefile for Legal. All jokes aside, Sharefile is a fantastic program, and their system brings a refreshing document-centered approach to case management that the other cloud-based providers simply don’t have. So if you find that your practice management system would be a lot more helpful if it better organized documents, rather than focusing so much on replacing Outlook, you need to check this out. Sorry, Jeff. The puppies dominated. Sorry, Jeff. You never stood a chance! CosmoLex case management system also announced a significant upgrade to its billing and recording capabilities – through its email system. Now, through its “Matter Circles,” you’ll get to stop worrying about whether all the information you need for any single case is easily accessible. Using Matter Circles, CosmoLex now allows you to combine your email with your case management, to integrate the information in your emails without you having to worry about it. More importantly, you can stop worrying about whether you’ve tracked the time, too! As an aside: It’s so cool to me that all these different practice management systems announced a similar benefit for their customers, but each done in a totally different way. See, Airlines and telecommunications companies, competition works! If you’re not familiar with Casetext, they’ve come up with a unique idea for legal research – crowdsourcing the editorial components from lawyers. While not nearly as revolutionary a concept as Ravel Law, it certainly has a “big data” feel to it. Their newest planned feature is a yet-to-be-released Premium subscription that will allow users to get detailed information about the editorials. For example, users will get to see what sentence in any particular case is written about the most by contributors. While I’m not totally in favor of the concept, ask Facebook and LinkedIn whether having people editorialize on their sites in exchange for using the site is a good business model. 12. Rocket Lawyer’s representatives were there and… it was a little bit uncomfortable. So, it had only been a few weeks since the ABA abruptly ended their partnership with Rocket Lawyer, but there didn’t appear to be any hard feelings. Maybe that’s because Rocket Lawyer’s sponsored event, Cocktails & Comedy, had been paid for prior to the cancellation! 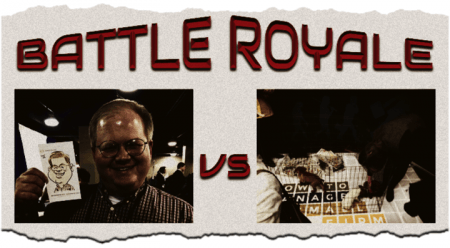 Bonus: Avvo waits until AFTER it’s done with ABA TECHSHOW to announce free legal forms. Did everyone see this? Avvo wants to give people legal forms for free, and provide an online “wizard” that guides them through the form. Before connecting them to – or even recommending – an attorney. But don’t worry, according to Avvo, this new program “rocks for attorneys.” Besides, they’re doing it for us! 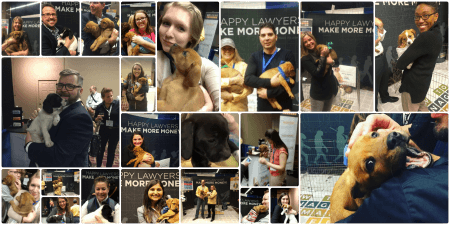 For a slideshow of the Best ABA TECHSHOW Swag, check out this post by Molly McDonough.